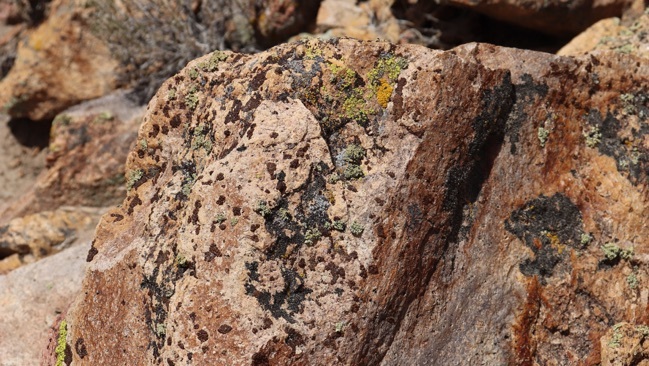 Part four: Cimarron and San Antonio Mines, and more! 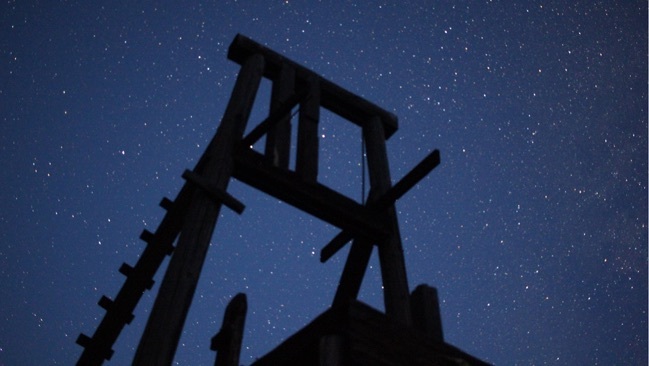 Above: A wooden headframe is silhouetted against the starry sky at the Cimarron Mine, NV. 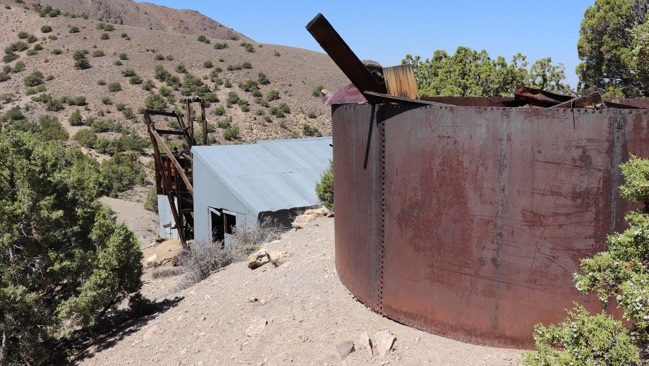 The Cimarron Mine is in the San Antonio Mountains of central Nevada. The trail I used to reach the mine is rarely traveled and was hard to follow at times. It had also been washed out by recent storms, and at times I had to pile rocks to rebuild parts of the route. By the time I reached the mine it was about 3:00 A.M. I set up my cameras to shoot time-lapse images of the stars and Milky Way before bedding down in my sleeping bag. Some mining took place in this area as early as 1862. 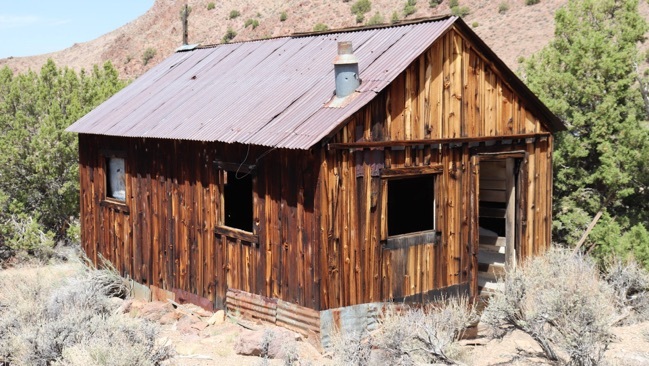 The Cimarron Mine and nearby San Antonio Mine were operated from 1937 to 1940, producing at least 13.3 ounces of gold and 47.2 ounces of silver. In the 1950s the claims were leased but no significant production took place. 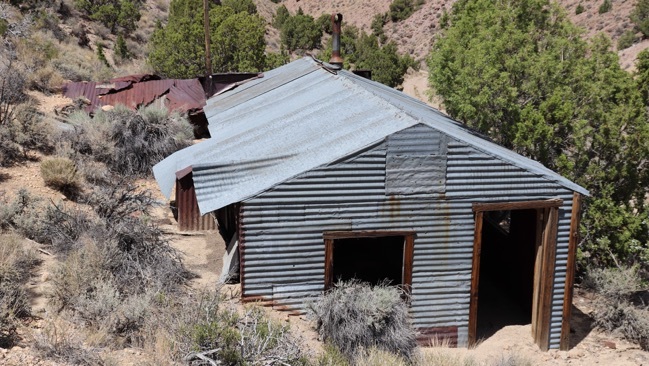 During the early 1970s the claims were owned by two women and some small-scale mining was still taking place. 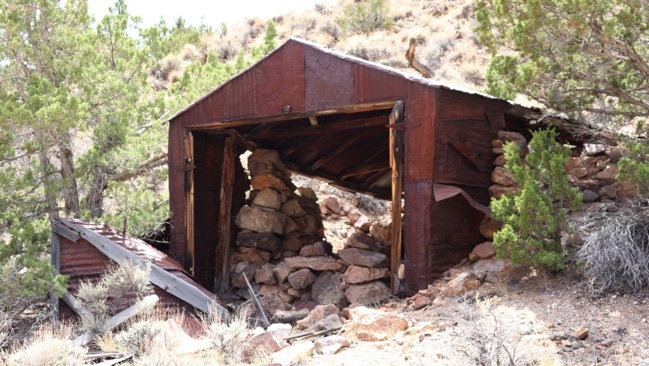 Structures at the Cimarron Mine include a wooden headframe, a large ore bin, and a blacksmith’s shop. Part of the blacksmith’s shop may have been used as a garage. 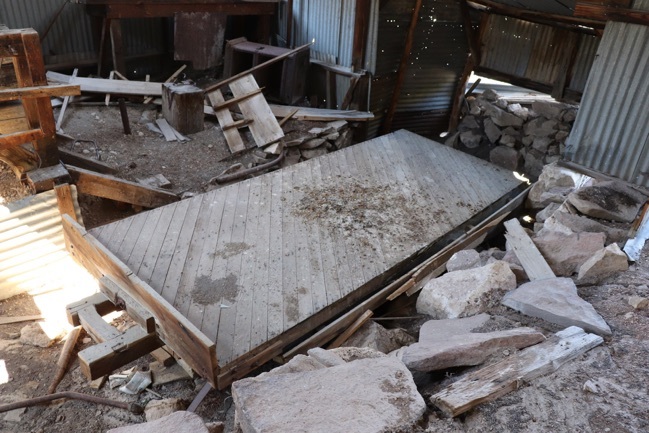 Just a few years ago the hoist house was still standing, but now it has fallen apart. 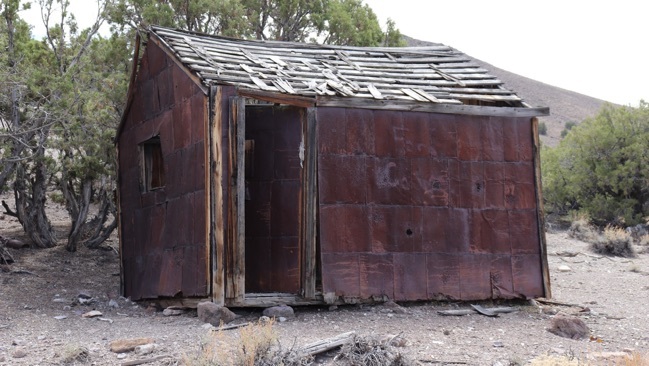 Click here to see a video tour of the Cimarron Mine, NV. 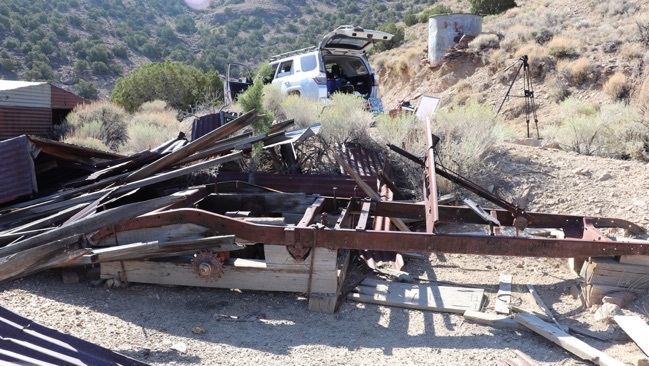 Above: Among the ruins of the hoist house is this frame from an early automobile. Although the engine is currently missing, this was obviously set up to power either the hoist or some other piece of mining equipment. 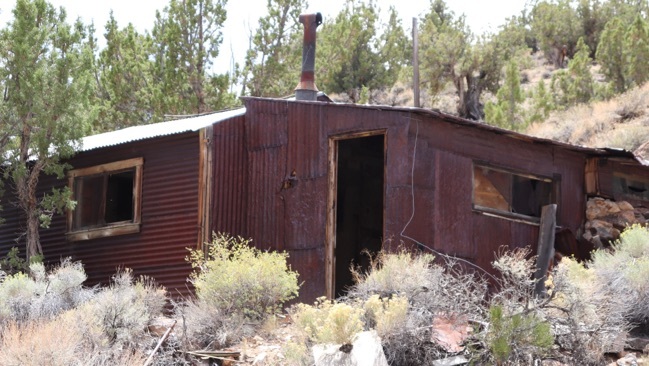 Above: The blacksmith’s shop is a wood-framed building covered with corrugated metal. 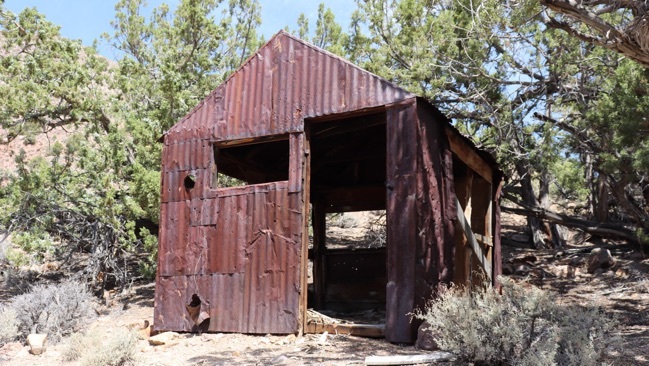 Parts of the structure have been modified using logs cut from local junipers or pinyon pines. 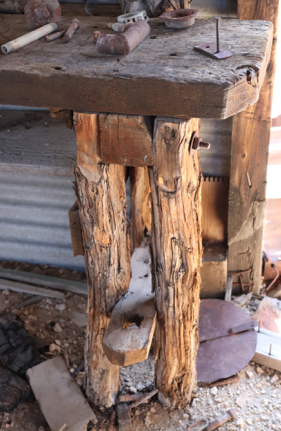 Right: One end of the workbench is supported by legs made from small logs and is an excellent example of rustic carpentry. 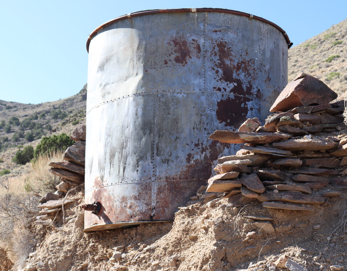 Below: A water tank set into the hillside above the mine. The San Antonio Mine is located a short distance away from the Cimarron Mine, and the two mines are closely associated. Both were operated primarily between 1937 and 1940, with only some small scale mining taking place during the early 1970s. 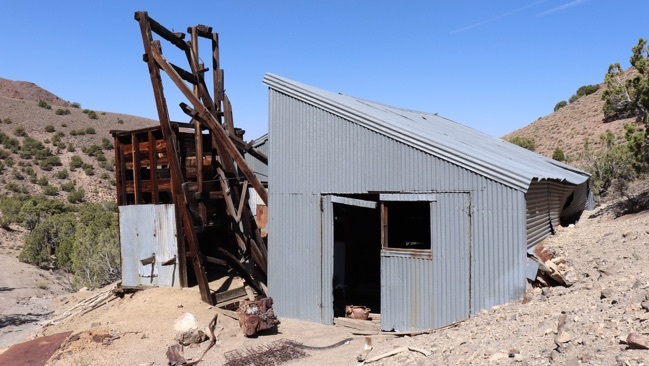 The structures at the San Antonio Mine consist of a small wooden headframe combined with a ore bin, and a single building which contained the hoist, the blacksmith’s shop, and even some milling/separating equipment. All in all, a very compact operation. The interior has some interesting features I’ve never encountered before. Another unusual thing about this mine is how close the mineshaft is to the building. The shaft is almost completely filled in, too. I suspect the shaft was never very deep, because there are no large piles of waste rock near the mine. 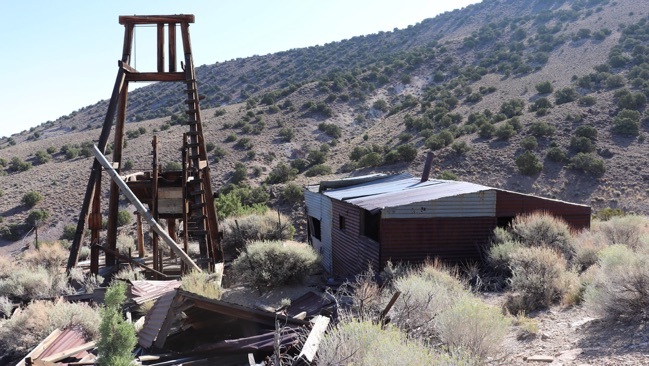 Click here to see a video tour of the San Antonio Mine, NV. Above: A large water tank overlooks the mine. There are two more tanks on the hillside below the mine. Above: The interior of the building. When I shot this photo, I was standing in the spot where the hoist would have been. Below: There is a wide, shallow trench in the middle of the building, which holds a shaker table. In recent years parts of the shaker table have been stripped off, probably by vandals hoping to find bits of trapped gold dust. In the corner across the room, is an area that served as a blacksmith’s shop. Note the large block of wood which once held the anvil. Potomac is adjacent to the San Antonio Mine. 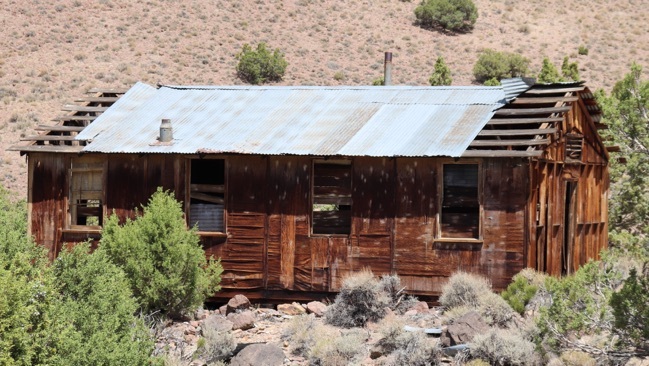 It’s one of the oldest mining camps in Nye County, dating back to 1862. The buildings here appear to be from various periods. The mess hall and two bunkhouses feature some plywood and gypsum board, indicating that they were either built, or upgraded, during a later period. 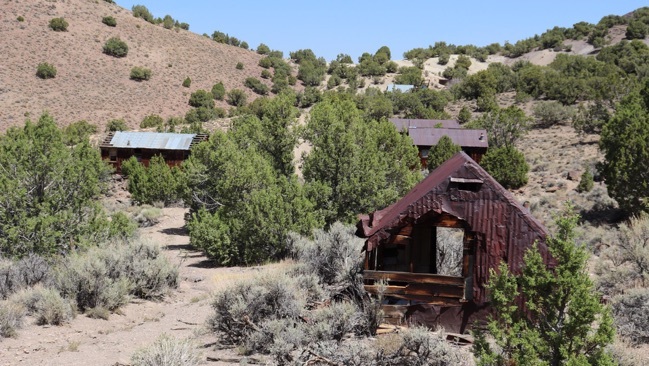 Some small cabins appear to be much older, with rusted metal over wood frames. There is a house that seems to have been occupied and expanded over a fairly long period of time. 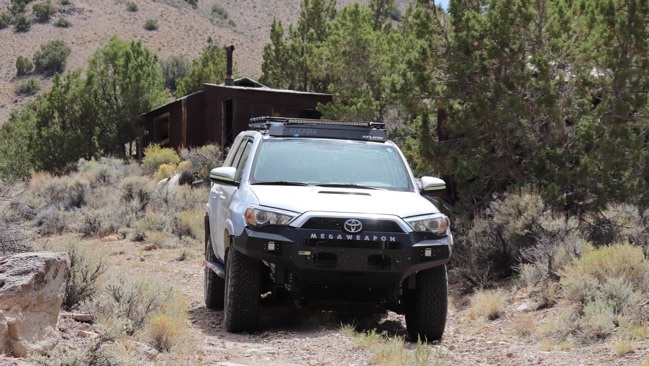 Click here to see a video tour of Potomac, NV. Above: This mess hall seems to be the most recent structure here. Below: One of two small bunkhouses at the site. 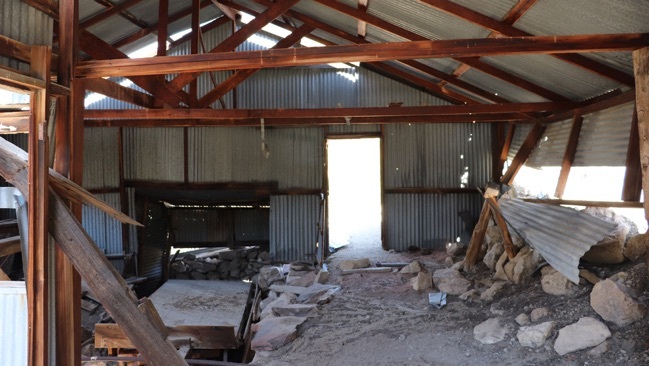 The other bunkhouse has been heavily vandalized. 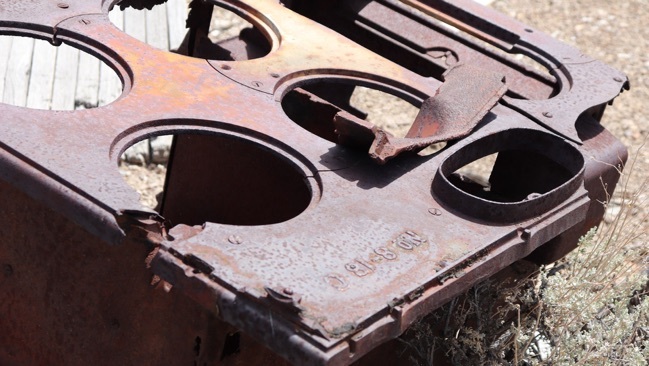 Above: The remains of a wood-burning stove. 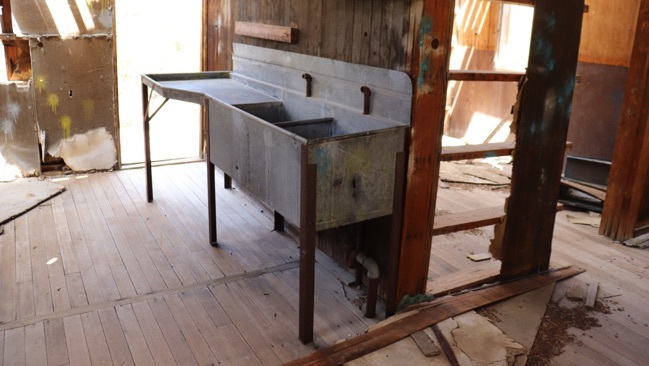 Below: This large metal sink is inside the mess hall. Above: Megaweapon parked near the old house. Below: This garage is next to the house, and seems to have been built over the ruins of an earlier stone dugout. Above: The west end of the house. Below: The east end of the house. 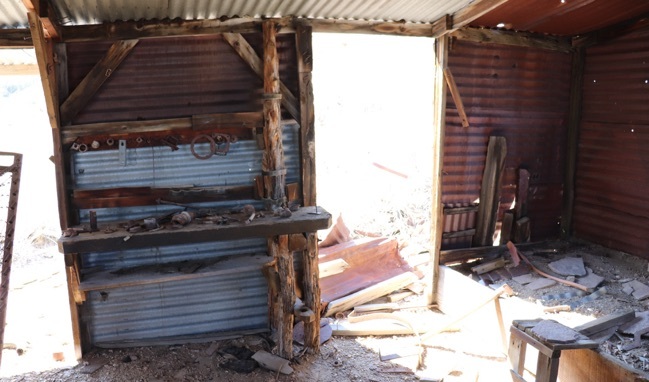 This end is a bit more well-built and is mostly covered with corrugated metal. Above and Below: Two more cabins in the Potomac area. 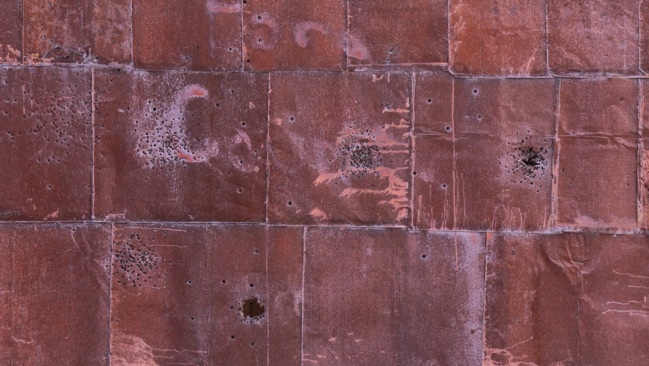 Above: A closer look at the patchwork of small metal sheets covering the cabin. 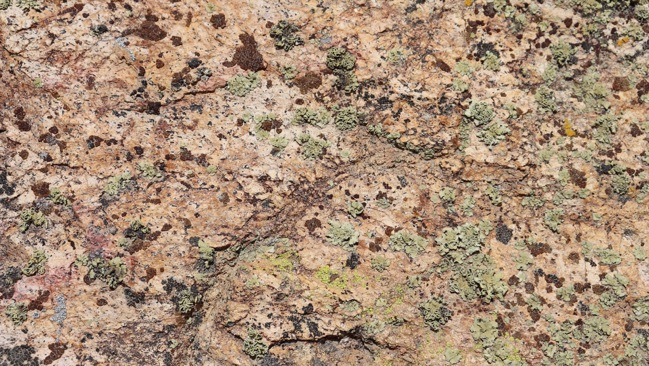 Above and Below: Beautiful stones with lichens, seen in the Potomac area. Coming up: The Lambertucci Roma Ranch and more, as the adventure comes to an end.